Casio Middle East has announced the release of their new BGA-210 range of colourful, sporty watches, the latest additions to its BABY-G family of shock-resistant watches for women. The new models are inspired by the look of sports uniforms, conveyed through the design and choice of colours and textures. 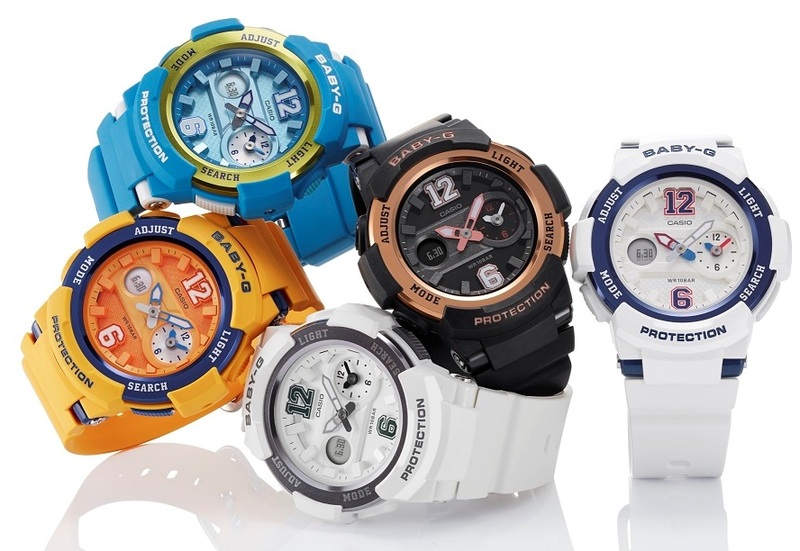 The BABY-G BGA-210 watches incorporate sporty design elements throughout, inspired by the look of a team uniform for basketball, football, or other sports. The watch face features a lattice pattern that evokes the look of sportswear fabric, and the dominant numbers “6” and “12” evoke the numbers on the back of a team uniform. The bezel, made from coloured aluminum to further enhance the sporty, refined look, enables a variety of color combinations with the body colors. The watches are equipped with Dual Dial World Time, which can display the time for two different cities simultaneously. The home time and world time display can be switched by pushing the button at the four o’clock position, to easily change time zones while traveling. These BABY-G watches are perfect for active women who travel and appreciate a stylish and sporty look, all around the world.